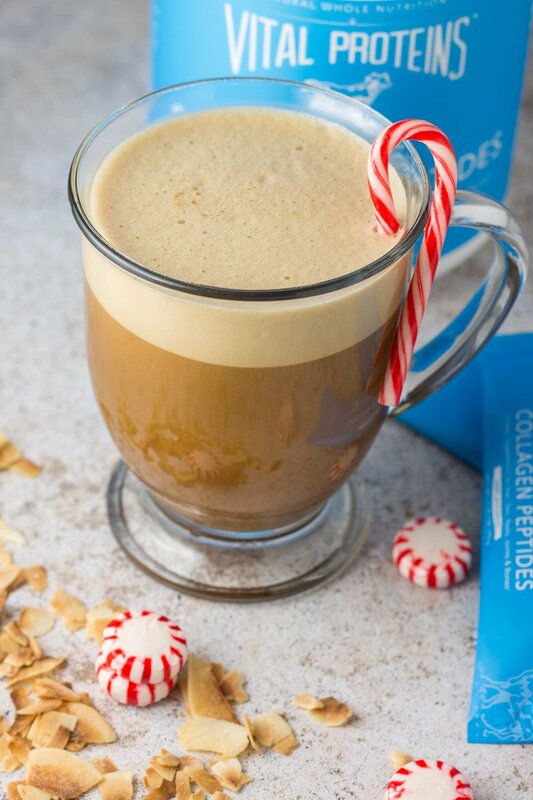 Collagen and caffeine is the best way to start the morning! 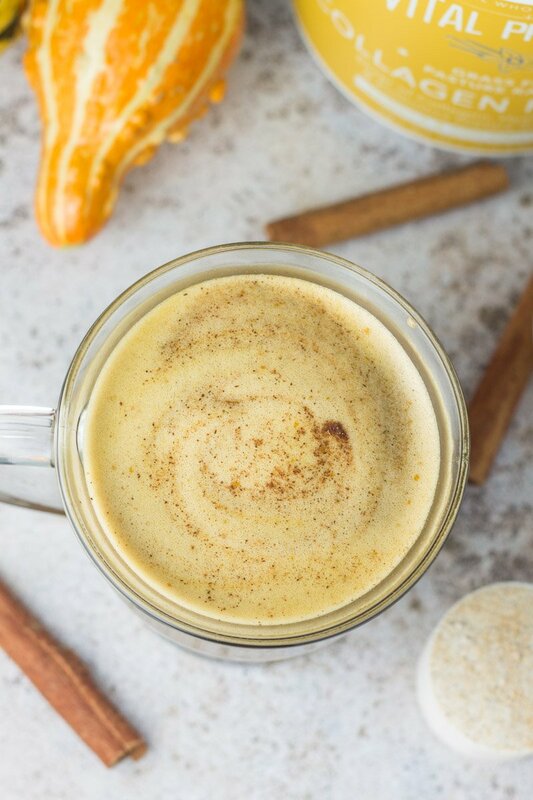 These holiday collagen coffee recipes are a simple way to mix up your morning routine. 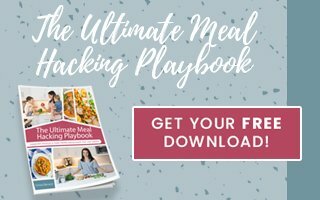 Easy recipes to add some flavor to your morning Joe, and packed with my favorite supplement, collagen! Merry Thanksgiving, ho ho ho, ’tis the season for some pumpkin. I know it’s early when I hit ‘publish’ on this post (especially since the first day of fall was just a few days ago), but I can’t help it…I LOVE THE HOLIDAYS! Just a tad excited. Sorry, I’ll tone it down. Sometimes I feel like a very eager Elf when the faintest glimmer of the holidays approaches. But I need to channel some Walter Hobbs, ’cause it’s a little too early to pee my pants over pumpkin-everything, scarves, and Christmas carols. CALM YOURSELF WOMAN. 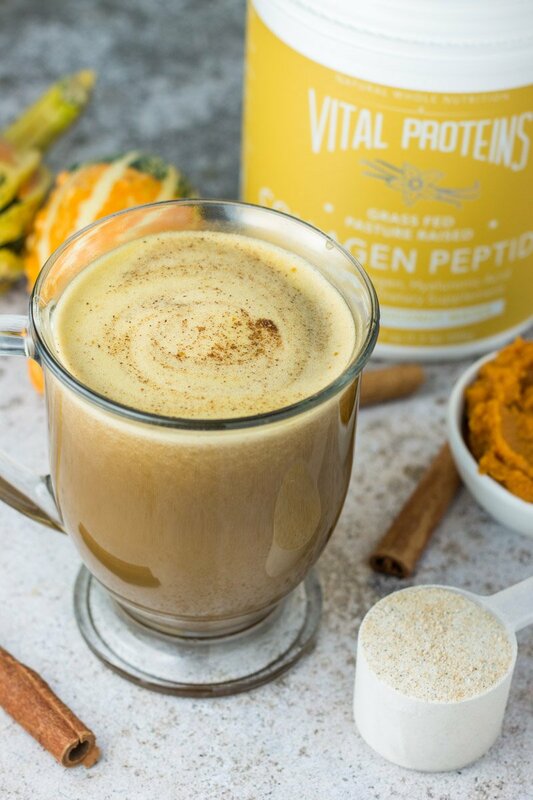 But as Elf would say, “I’m in love, I’m in love, and I don’t care who knows it!” Yes, I’m in love with Vital Proteins collagen. I’ve been using this stuff religiously for the past (almost) year, and I am so excited about what it’s done for my hair, skin, joints, and more. If you’re new to the collagen thing, or haven’t seen my post about why collagen is my BFF, head over to this post: Why I Take Collagen and I’ll break it down for ya. But for now, let’s just dive in to the coffee/collagen goodness. Brew coffee and pour into a blender. 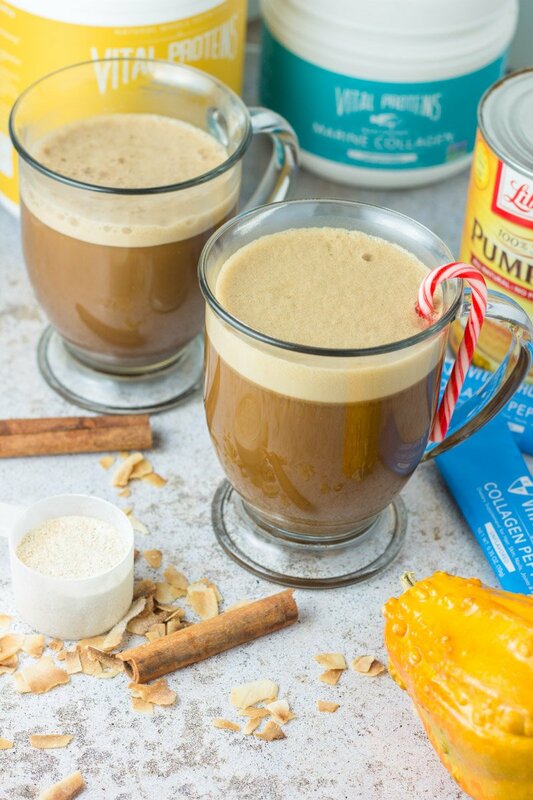 Add the pumpkin puree, pumpkin pie spice, maple syrup, coconut cream (or full-fat coconut milk), and collagen (you can sub the vanilla collagen for unflavored). Blend well and serve! Brew coffee and pour into a blender. Add the cocoa powder, cinnamon, maple syrup, almond milk, and collagen (you can sub the marine collagen for the beef collagen peptides). Blend well and serve! Brew coffee and pour into a blender. Add the coconut butter, honey, peppermint oil or extract, coconut milk, and collagen (you can sub the beef collagen peptides for the marine collagen or even the vanilla collagen). Blend well and serve! 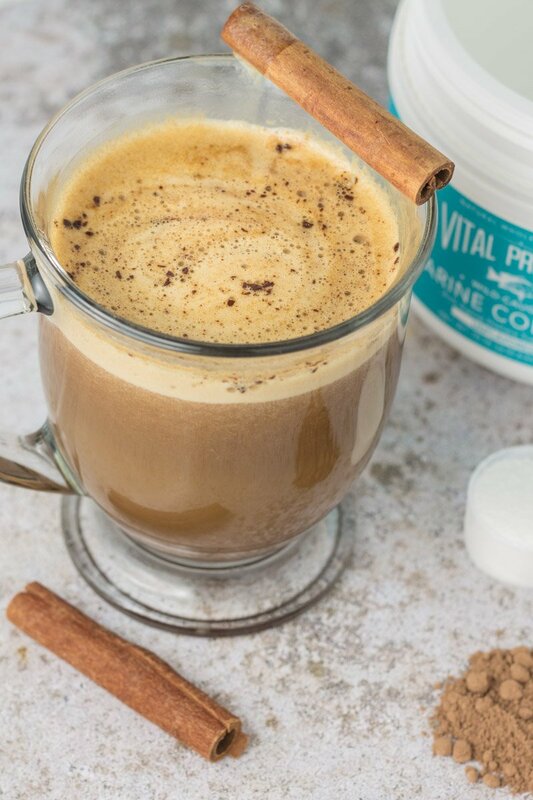 Adding collagen to your coffee is an easy, simple way to add a power supplement that does amazing things for your skin, hair, nails, joints, and even your gut! Not convinced? Check out this post HERE for more info. Vital Proteins products can be purchased HERE. BONUS ALERT – all U.S. orders quality for free shipping. Whoop whoop! Is coffee your spirit animal? Check out this paleo Snickers coffee creamer, paleo toasted coconut coffee bread, and these paleo almond cocoa mocha energy balls. Happy holidays and happy caffeine consumption! Thank you for these amazing coffee recipes. I absolutely love Vital Proteins! They have almost been a new way of life for me. I just got my 2 box delivery yesterday! I broke my big toe bone into 5 pieces back in April while preparing to workout on the Leg Press at my gym. I dropped one of the 45 lb weight plates on my foot, talk about ouch! Well, I’d been taking Vital Proteins for several months prior to that and my foot doctor told me that those collagen peptides were probably what helped my shattered bones to fuse back together literally in about 3 weeks time. My nails, like you, have always been relatively healthy but they are harder now and my hair is so much shinier and healthier through years and years of coloring and processing. So I am a true believer in collagen. THAT IS AMAZING! Thank you soooo much for sharing your story. I’m sure it will be so useful for future readers! Um, hello! These all look amazing. 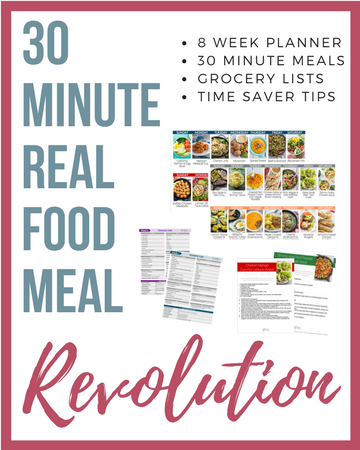 Thank gosh for you and your recipes – you, without a doubt, have found your calling and I am so happy you did because everybody else is benefiting from it!